Linger in elegance and comfort in a magnificent oceanfront villa set like a gleaming pearl above a secluded cove in the prestigious estate of Judith's Fancy. Linger in elegance and comfort in a magnificent oceanfront villa set like a gleaming pearl above a secluded cove in the prestigious estate of Judith's Fancy. Sugar plantation ruins nearby testify to the charms that attracted St. Croix's earliest European visitors to settle beside these north shore beaches. Today, this peaceful gated community near the Salt River is blessed by the same trade winds that brought explorers to its shores. On arrival, even before going inside, you'll be captivated by one of the island's most beautiful outdoor living spaces. A dramatic, oversize pool trimmed in cobalt blue tile, surrounded by an expansive coral-toned patio, overlooks the cove and Caribbean below. Accented by tropical plantings of ixora, schefflera, palms and sea grape trees, a round dipping spa is elevated near the pool for luxurious indulgences beneath the stars. Reflected in the pool from above, the villa's white wrap-around galleries enjoy marvelous views of both the pool and the sea. Through heavy mahogany entry doors, a sky-lit atrium draws one into an airy greatroom, where multiple seating areas are separated by arches echoing St. Croix's Danish heritage. Start your day here with coffee while watching the news on a massive flat screen TV curled up on leather sofas in the media area. Play a rousing round of bridge at the games table with a wet bar at hand. And review the day's events in a gathering space where massive mahogany shutters open for views of the sea. You'll often want to dine outdoors by the pool, but for more formal occasions, another Danish arch from the greatroom leads to a charming dining area with a round glass table seating eight, lit from above by a decorative, island-inspired chandelier. Adjacent to the dining room is the kitchen of a professional chef?s dreams. Granite countertops and pickled wood cabinetry are accented by tumbled marble tiles, stainless steel SubZero double refrigerator/freezer and a Viking oven. The centerpiece is a mahogany island with a convenient, extra prep sink, while an antique pantry lends its charm to today?s modern conveniences. Elegant designer fabrics in understated tones of gold, green and tan are perfectly paired throughout the villa with tropical woods, artworks, and natural fiber rugs to reflect classic West Indian style. High, beamed ceilings with fans, cool terra cotta floor tiles, and wafting tropical breezes make the villa an oasis of comfort as well as beauty. A few steps up from the greatroom, an apartment-sized master suite is designed for serenity starting with a granite and tile spa bathroom with three separate spaces, centered by a light-filled walk-in tub/shower room. An antique cabinet holds fluffy towels, and his-and-hers bathrooms adjacent to the bathing room are outfitted with granite-topped vanities and bronze faucet fixtures. A full sitting room for work or reading is stocked with cushy overstuffed chairs, library shelves, and an antique desk with internet access. Through double doors, the air-conditioned master bedroom features a gorgeous mahogany four-poster king bed and its own demi-lune patio with spectacular sea view. A second air-conditioned bedroom suite leads up from the entry atrium and features its own sitting and sleeping areas on two levels, with a television that swivels for convenient viewing from either space. Close to the king-sized bed, a full ensuite bathroom has specialty tile work, a glass shower, and a vanity crafted of mahogany. A third bedroom is situated in a full apartment on the pool level, reached from either an exterior entrance or by a spiral staircase from the greatroom. In the apartment you'll find a full kitchen, sitting area with a flat screen TV, and full bathroom accompany an air conditioned bedroom with queen-sized four poster bed. A second bathroom and shower lead to the pool, a thoughtful convenience when outdoor living spaces are in use. All told, this beautifully-designed villa features three bedrooms and four and one-half bathrooms. The second kitchen in the pool-level apartment is delightfully handy for sunny day snacks and beverages. Spend your days soaking and sunning in peace and privacy or try snorkeling at the cove just below your villa, absorbed in your own private paradise. But don't forget that just minutes away by car, you'll have easy access to Christiansted's fine restaurants, duty-free boutique shopping, and sightseeing. Tour the waterfront's National Historic Site surrounding Fort Christiansvaern or stroll the boardwalk to arrange sport fishing charters and day sails to Buck Island. Even closer to your villa is the historic Salt River where Columbus sent a landing party ashore in 1493. There, you can rent a kayak to explore the ecological park, or Scuba dive through sea canyons that plunge deep below the water's surface. A short drive to the west is famous Cane Bay with its bohemian waterfront restaurants, beaches and spectacular diving. 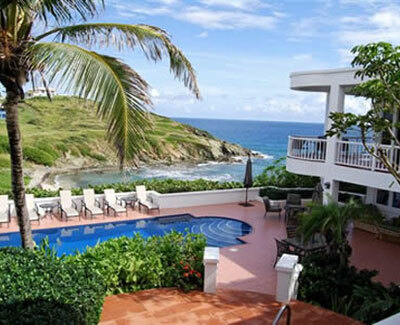 A superb location, stunning views of the sea, offshore islands, and the lights of Christiansted are simply the icing on the cake at Seacliff Cove--one of St. Croix's most luxurious homes.